Novel Engineering project teaches kids about engineering by using fiction books. 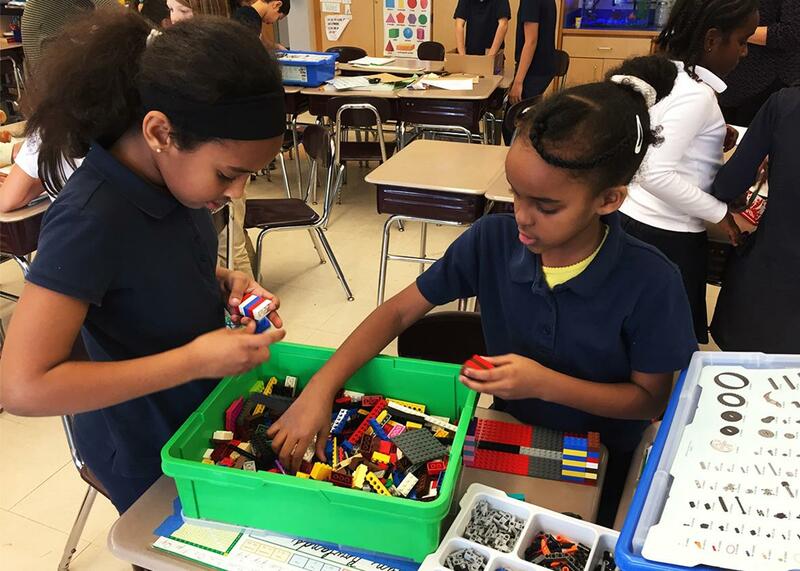 At Linden STEAM Academy in Malden, Massachusetts, third graders build a Lego prototype as part of the Novel Engineering initiative, which mixes engineering with literacy in elementary school classrooms. One recent morning, at a public school in Malden, Massachusetts, north of Boston, teams of third graders rushed around programming sensors on computers, wiring them to motors, digging into bins of Legos and gears, and rummaging through boxes of paper towel rolls, egg cartons, and pipe cleaners. Their mission was to protect a baby turtle from a dog—a beloved, mischievous black Lab named Tornado, the title character of a novel they had read for class. The fictional dog is named after a twister that flung him into the life of a young farm boy. During one of their adventures, the thirsty pup drinks from a pet turtle’s watery home and slurps up the creature in the process. Hence the turtle-rescue project for these third graders at the Linden STEAM Academy (STEM plus Art). It’s part of an initiative called Novel Engineering led by researchers at nearby Tufts University, in which engineering challenges are plucked from the plots of assigned books. The elementary school lesson plan, developed at Tufts’ Center for Engineering Education and Outreach, is backed by the National Science Foundation. The scarcity of engineering in grade schools not only slows the supply of home-grown engineers, it hurts their skills, according to Morgan Hynes, an engineering professor who helped lead Novel Engineering before leaving Tufts for Purdue in 2013. That’s because the crucial human pieces of engineering—learning the end-users’ needs and tendencies and working collaboratively to solve problems—can get lost in the shuffle when “real engineering” is postponed until students have mastered advanced math and physics. She said Novel Engineering has also spurred writing practice, because students must write and revise descriptions of the problem they’re working on and the design ideas they have to address it. There’s more writing at the end, when students are often asked to write a letter to their character explaining the invention, or to rewrite a scene from the book that incorporates their new idea. Smith’s class read Tornado weeks before building their prototypes, as part of a larger unit on extreme weather. In a subsequent class, the students jotted down the characters’ challenges and brainstormed solutions. They settled on the turtle problem and then spent another class sketching, writing, and revising their engineering ideas. Interestingly, Novel Engineering just started mixing technologies, such as Lego robotics and littleBits circuits, into their approach about 18 months ago. Initially, and still today, they focused on low-tech projects using recyclables, found objects, and craft supplies readily available in most schools. However, students kept dreaming up engineering solutions with motors, sensors, sounds, and other functionality that lent themselves to technology tools CEEO had used in other initiatives. So, the Novel Engineering team has been piloting a high-tech version at the STEAM Academy, while putting together a book of worksheets and sample projects. Going high-tech does change what stories that will work in the curriculum, she said, because solutions should make sense for the book’s setting. Infrared sensors and robots can’t help characters in ancient Egypt or colonial America, for instance.